Kaʻū Desert Footprints Trail is open. A desert in Hawai'i? The Kaʻū Desert isn't technically a desert because it receives too much rainfall. The desert-like appearance of Kaʻū is due to the combination of the rain shadow from massive Mauna Loa and acid rain created from the gases erupting from Kīlauea Volcano. The ph of this acid rain can be as low as 3.4 and inhibits most plant growth. The lava here is also very permeable, percolating most rainwater deep into the earth before plants can avail themselves of it. This desert is an amazing and unique landscape on an island full of such landscapes. 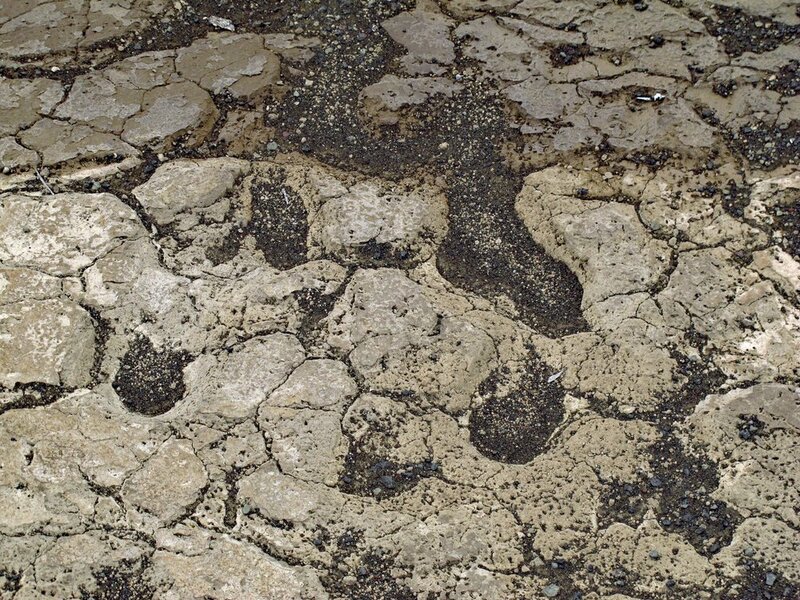 Attesting to the power of the volcano here are two-hundred year old fossilized human footprints in mud-ash. Their origin isn't entirely clear, but it is surely fascinating to walk among the footprints of the ancient Hawaiians in this desolate place. Read more below about the history of the footprints. There are two longer hikes that use this trailhead. See the Kaʻū Desert Trail and the Mauna Iki Trail. Gear: Standard hiking gear. Don't forget the raingear. The trail is quite rough, so boots are a good idea. This part of the island is 3500' above sea level, so expect cooler temperatures. Hike: From the trailhead, hike south along the Footprints Trail for 0.84 mile until you see a small shelter. Along the way, enjoy marveling at the unique landscape of the Kaʻū Desert. Supposedly, the CCC placed the shelter here in 1941 with a glass enclosure over the footprints. Carelessly designed, the glass condensed water and eventually damaged the prints. The glass has been removed inside the shelter, but the damage done to those prints is pretty devastating. I can't for the life of me discern any actual prints inside the shelter. Ironically, the best footprints are now scattered in the area around the shelter. The shifting sands expose and cover prints from time to time. As stated in the overview, the footprints are about two-hundred years old. For years, Park Service employees thought that most of the prints were created by the retreating army of Keōua Kuahuʻula, who was battling the famous Kamehameha I for dominance of the island. A large number of his men died asphyxiating in the disastrous 1790 eruption of Kīlauea. The prints were assumed to be theirs until recently when examination of the prints concluded that most of them were not warriors, but women and children. Some are even older than 1790, and the most recent research indicates that almost all the prints are attributable to everyday circumstances. Whatever their origin, it’s exciting to find 200+ year old footprints frozen in time in wet mud-ash, even if they weren’t created by a decimated army. Return the way you came.